This contest is closed. The winner was selected on 3/11/2019. The KQCH Hits Club (the "Service"), operated by Triton Loyalty, and KQCH-FM (together, Triton Loyalty and KQCH-FM are referred to as "we", "us" or "our") is provided to you ("you," "your" or "User") under the following terms and conditions, including any amendments thereto and any additional terms and conditions, rules or policies that may be applicable to particular offerings made in connection with the Service (collectively, the "Terms and Conditions"). We reserve the right to update or change these Terms and Conditions from time to time. Any such changes shall be reflected in an updated version of the Terms and Conditions posted on this site. By continuing to use the Service following the posting of any such change, you will be deemed to have agreed to the amended version of the Terms and Conditions. Any failure to comply with these Terms and Conditions by you may result in the termination of your account, and the forfeiture and relinquishment of all Points you have accrued in the Service. BY REGISTERING TO USE THE SERVICE, YOU AGREE TO BE BOUND BY THESE TERMS AND CONDITIONS, SO PLEASE READ THEM CAREFULLY. Unless otherwise specified in connection with particular offerings, participation in the Service is open only to natural persons who are 13 years of age or older. Employees or agents of KQCH-FM, Triton Loyalty, and each of their respective affiliates, and immediate family members of or persons domiciled with any such persons are not eligible to participate. In consideration of your use of the Service, you agree to provide true, accurate, current and complete information about yourself as prompted by the registration form and to maintain and promptly update your personal data to keep it true, accurate, current and complete. If you provide any information that is untrue, inaccurate, not current or incomplete, or if we or any of our service providers have reasonable grounds to suspect that such information is untrue, inaccurate, not current or incomplete, we have the right to suspend or terminate your account and to refuse any and all current or future use of the Service (or any portion thereof) by you. You may not register with a disposable email address. Only one member account per person and two member accounts per household. If you are 13 years of age or under you cannot post information about yourself on the website or complete the registration process. You can, among other things, review your accumulated Points, review the Terms and Conditions as amended from time to time, and review redemption options at kqchfm.clubviprewards.com . KQCH-FM and Triton Loyalty (collectively, 'us', 'we', 'Operators') have created this privacy statement in order to demonstrate our firm commitment to privacy. The following discloses our information gathering and dissemination practices for the KQCH Hits Club website ('Site'). This sweepstakes will begin on 2/12/2019 2:00 AM CT and all entries must be received by 3/11/2019 2:00 AM CT. You currently have 0 entries. ·SWEEPSTAKE PERIOD. This sweepstake (the "Sweepstake") is sponsored by Enticent, LLC d/b/a Triton Digital located at 2125 Barrett Park Drive., Suite 112B, Kennesaw, GA 30144 (the "Sponsor") and runs between 02/12/2019 at 2:00 AM CT ("Eastern Time") and 03/11/2019 at 2:00 AM CT (the "Sweepstake Period"). The clock used by Sponsor to compute the Entries (as such term is defined below) will be the official clock to determine the date and time of receipt of an Entry.For the purposes of this Sweepstake, the "Sweepstake Group" is composed of the Sponsor and Summit Media, LLC (the "Publisher") together with their respective affiliate, related parent, sister and subsidiary companies, retailers, franchisees, and any other corporation, partnership, so proprietorship or other legal entity directly involved in the Sweepstakes and each of their respective officers, directors, employees, agents, dealers and other representatives. Online Entry: LIMIT: one (1) online entry per person per day during the Sweepstake Period.To obtain one (1) online entry into the Sweepstake you must (i) have a registered member account on the Publisher's website. If you do not already have one you can create one free of charge; and (ii) visit http://digitalivy.com/BUUJFT (the "Sweepstake Website") during the Sweepstake Period and complete the entry form with your full name, email address, age and ZIP code and, if required, submit the required number of points, which number of points will then be deducted from your account. An entry will not be valid unless all of the required fields of the online entry form are completed and the information is valid. Mail-in Entry: You may also participate in the Sweepstake through a mail-in entry. No Points are required for a mail-in entryLIMIT: one (1) mail-in entry per person during the Sweepstake Period.In order to participate in the Sweepstake by mail, you must mail a 3" x 5" card to Triton Digital, Irish Adventure Sweepstakes, 2125 Barrett Park Drive., Suite 112B, Kennesaw, GA 30144, which must include the following information in legible, hand-printed or typed English: (i) your full legal name; (ii) complete mailing address; (iii) home telephone number with area code; (iv) email address; (v) your age; (vi) your gender; and (vii) the name and Item ID number of the Sweepstakes (BUUJFT) (each a "Mail-in Card", and collectively the "Mail-in Cards"). All Mail-in Cards must be received on or before the end of the Sweepstake Period, except that if the end of the Sweepstake period falls on a Saturday, Sunday or statutory holiday in the United States, your Mail-in Card must be received by the immediately preceding business day. If you are concerned about your Mail-in Card being received by the end of the Sweepstake Period, during the three (3) business days immediately preceding the end of the Sweepstake Period you may fax in a photocopy of your Mail-in Card to 770-919-2120. The facsimile must contain a photocopy of the Mail-in Card with the full information listed above and must be received by the end of the Sweepstake Period. After faxing a copy of your Mail-in Card, you must still mail in your original Mail-in Card for your facsimile entry to be valid. Your original Mail-in Card must be postmarked prior to the end of the Sweepstake Period and must be received no later than four (4) days following the end of the Sweepstake Period. If your original Mail-in Card is not received by mail within the requested period of time, your facsimile entry will be void and you will forfeit any and all interest in the prize(s). Upon receipt and verification by the Sponsor of your Mail-in Card, you will automatically receive one (1) entry in the Sweepstake. The Mail-in Cards will be considered "Entries" if they comply with the drafting requirements and are received within the requested timeframe. Sponsor is not responsible for any incomplete, late, lost, misappropriated, illegible, damaged, postage-due or misdirected mail-in entries. 4.PRIZE. 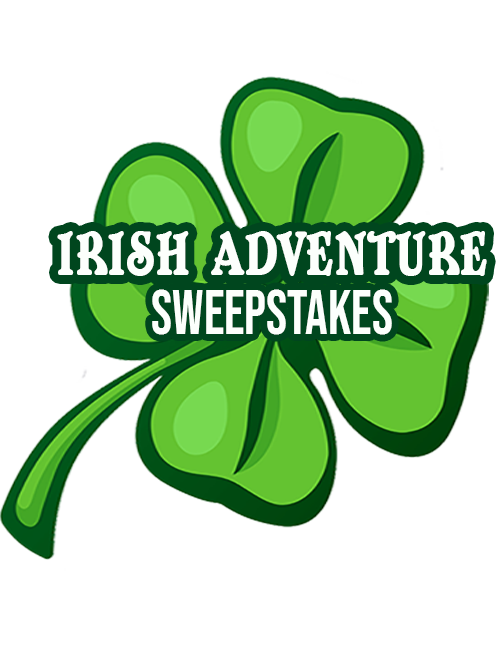 There is one (1) grand prize available to be won, consisting of a trip for two (2) to Dublin, Ireland (the "Prize"). ·In no event will the value of the Prize exceed a total ARV of US $5,000. Based on an average round-trip flight from Hartsfield Jackson Airport to Dublin Airport, the total ARV of the Trip is five thousand US dollars (US $5,000) determined as of January 25, 2019, and may vary depending on the date of booking, the city of the winner's residence, and the date of travel. Winner may choose the cash equivalent instead. Sponsor reserves the right to provide alternative methods of transportation or another hotel than those provided above. Winner and guests must travel together on the same itinerary. It is Sponsor's responsibility to arrange transportation and reserve the hotel. The Trip may not be used towards any type of frequent flyer mileage, or other reward points accumulation program. The Trip must occur between March 25, 2019 and May 25, 2019, excluding statutory holidays. Winner may choose the cash equivalent instead. In that case, winner will receive five thousand dollars (US $5,000) in cash. If winner chooses to take the cash equivalent, winner must notify the Sponsor no later than three (3) days following the receipt of a notification pursuant to Section 6 below. Winner and guests will be responsible for all expenses not specifically included in the Prize (as described above), including transportation between winner's residence and the nearest major airport, meals, alcohol, in-room entertainment, car rentals, insurance, medical/health expenses, gratuities, excess baggage fees, communication charges and any other personal expenses and incidentals. Winner is responsible for ensuring that all necessary travel documents (including a valid passport where applicable) are obtained for him/her and by his/her guest prior to ticketing. Winner must comply with all hotel check-in requirements, including the presentation of a major credit card. Sponsor is not responsible if winner or guest is denied access to the aircraft or any methods of transportation. In such an event, winner and/or guest will be solely responsible for any expenses incurred and the Trip may be forfeited, in whole or in part. Prize is non-transferable. Sponsor reserves the right to substitute the Prize for one of equal or greater value in Sponsor's sole discretion. No more than the stated number or value of Prizes will be awarded. All taxes, fees, and surcharges on prizes are the sole responsibility of the winner. Winner may be required to complete a W-9 taxpayer identification form. 5.SELECTION. Limit: One (1) Prize during the Sweepstake Period. On 3/11/2019 at Sponsor's offices located at 2125 Barrett Park Drive., Suite 112B, Kennesaw, GA 30144, at approximately 08:00 AM ET, one (1) Entry will be selected at random from all eligible Entries received during the Sweepstake Period as eligible to win the Prize. ·NOTIFICATION AND PRIZE DELIVERY. The selected entrant will be notified by email and/or by telephone, using information provided at the time of entry, within approximately five (5) business days of the draw date. If a potential winner fails to respond within the three (3) day period following attempted notification or if the notification is consistently returned as undeliverable or fails to reach the potential winner for any reason (including, without limitation "soft" and "hard" email bounces) or if the potential winner fails to respond for any reason to the notification as directed, the potential winner will be disqualified and, time permitting, an alternate winner will be selected, who will be subject to disqualification in the same manner.Sponsor's agent or representative will arrange for delivery of the Prize by mail to the mailing address provided by the winner. Sponsor is not responsible for any change in entrant's email and mailing address. Sponsor is not responsible for any costs incurred by a winner to collect their prize. Sponsor will not ship any prizes to an address outside the United States. 8.PERSONAL INFORMATION.Sponsor and its authorized agents will collect, use, and disclose the personal information you provide when you enter the Sweepstake for the purposes of administering the Sweepstake and prize fulfillment. By entering this Sweepstake, you consent to such collection, use, and disclosure of your personal information. You may also be offered the opportunity to receive additional communications from Sponsor about its products, and upcoming sweepstakes and promotions. 9. RIGHT TO VOID / MODIFY / SUSPEND.Sponsor reserves the right to terminate, suspend or modify this Sweepstake, or these Official Sweepstake Rules, in whole or in part, at any time and without notice or obligation if, in Sponsor's sole opinion, any factor interferes with its proper conduct as contemplated by these Official Sweepstake Rules. Without limiting the generality of the foregoing, if the Sweepstake, or any part thereof, is not capable of running as planned for any reason, including but not limited to infection by computer virus, bugs, tampering, unauthorized intervention, fraud, programming errors, or technical failures, which, in the sole opinion of Sponsor, corrupt or affect the administration, security, fairness, integrity or proper conduct of this Sweepstake, Sponsor may, in its sole discretion, void any suspect Entries and: (a) terminate the Sweepstake, or any portion thereof; (b) modify or suspend the Sweepstake, or any portion thereof, to address the impairment and then resume the Sweepstake, or relevant portion, in a manner that best conforms to the spirit of these Official Sweepstake Rules; and/or (c) award the Prize from among the eligible, non-suspect Entries received up to the time of the impairment in accordance with the winner selection criteria discussed above. 10.LIMITATION OF LIABILITY AND RELEASES.By participating in this Sweepstake, entrants agree to release and hold harmless all of the members of the Sweepstake Group (collectively, the "Releasees") from and against any and all claims, injury or damage (including without limitation direct, indirect, incidental, consequential or punitive damages), to persons or property, arising out of or relating to (a) entry or participation in this Sweepstake, including access to and use of the Sweepstake website, (b) any claims based on personality or privacy rights, defamation or prize delivery, or (c) the possession, use, misuse, or redemption of a prize (including any travel or activity related thereto), or the merchandise in which it is redeemed, if applicable. Some jurisdictions do not allow the exclusion or limitation of incidental or consequential damages, therefore such exclusions may not apply to you. 13.Winner's List: To obtain a copy of the winner's list, available thirty (30) days following the end of the Sweepstake Period, please send a self-addressed, stamped envelope to: Triton Digital Sweepstakes Winner's List, 2125 Barrett Park Drive., Suite 112B, Kennesaw, GA 30144. Please indicate which Sweepstakes winner's list you would like to receive.